Inverter generators are handy tools used to power appliances and machines. You can have energy, but sometimes need to convert it to usable energy. This is where the inverter generator comes in. Raw electricity is changed to DC, or direct current, first and then back to a standard AC power of 120-volts, 60-Hz. This newly created AC power is in the form of sine waves, or “clean energy.” You need clean energy because you may have to power a delicate machine like a computer or laptop. With unrefined energy, you wouldn’t be able to do this. As with all equipment though, there are many options in the marketplace. We decided to sort through them all and come up with the best inverter generators for our readers. We tested them for motor power, efficiency, user-friendliness, noise level and extra features. After careful consideration, here is our list of the best inverter generators available. 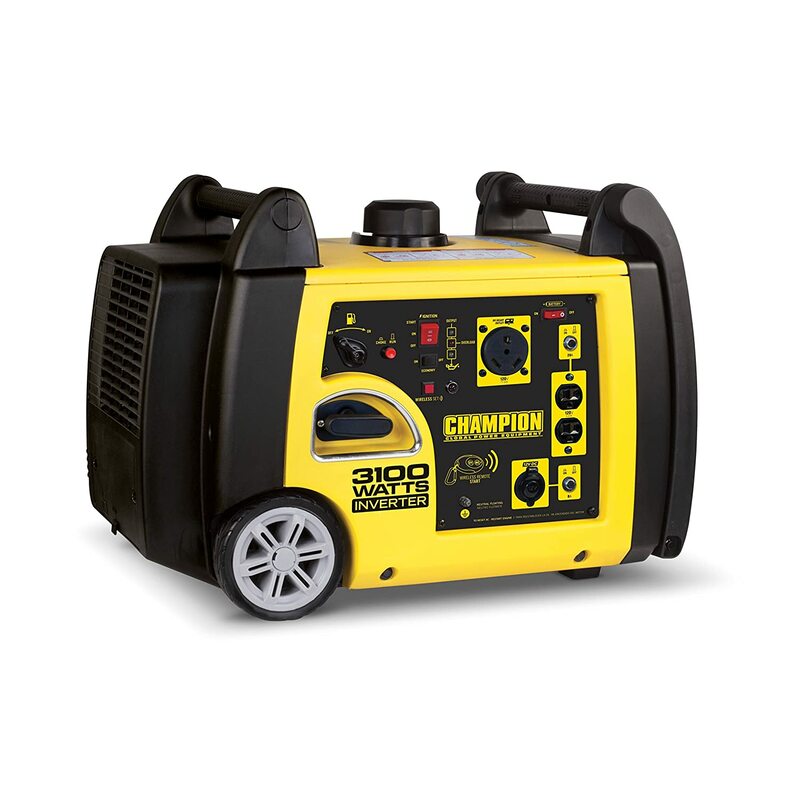 Our number one gold choice for inverter generators is the Yamaha EF2000iS Gas Powered Portable inverter generator. This one won out because it has a lot to offer. It has the motor power, flexibility, efficiency and noise level that made it a stand-out during our research. Let’s look at its best qualities. When it comes to the motor, it has a 1600-watt AC output, with a maximum output of 2000 and 13.3 amps of power, with a maximum of 16.7 amps. It also can put out 8A/12V DC if you use the compatible cabling that comes with the unit. 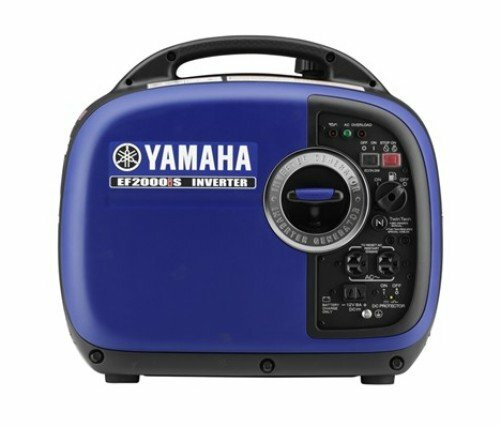 An additional feature of the Yamaha brand inverter generators is their “Twin Tech” technology. That means you can join two units to maximize power at 3600 watts and 30 amps. You’ll need to purchase an extra cable to join units, but if you need increased power this is one of the easiest ways of doing it. The efficiency of the Yamaha EF2000iS is another key feature that made it our number one pick. As explained, it uses conversion of energy to create clean energy. What clean energy means is that you can power delicate things with it, such as appliances, tools, computers and televisions. Without clean energy, these things wouldn’t work on generator power. This is a necessity as an inverter generator. While some people want to use added energy for tailgating or camping, other people still need energy for expensive electronics. This is where the Yamaha EF2000iS fits the bill. One of the best features about the Yamaha EF2000iS is its noise level. Anyone who has ever used a generator knows that they aren’t the quietest machines. In fact, it’s hard to talk at all when one is running. This one is not like that. Here’s an example of its noise efficiency: an electric razor emits 68-decibels. This inverter generator emits 61-decibels. That means it’s quieter than your razor when running! Not only is that a huge advantage, but it is almost miraculous. You can thank Yamaha’s noise reduction technology for this one. They have a special sound-blocking design and a noise-absorbing glass wool box. Plus, the feet of the inverter generator are specially made with vibration-isolation. Moving on to the extras, the Yamaha EF2000iS has a lot of them. It can run continuously up to 10 ½-hours on one full tank of fuel. Yamaha also built it with a special “Smart Throttle Load” technology that lets the generator adjust automatically to match the motor’s speed to the load it’s carrying. This alone helps to make it one of the most efficient inverter generators around. It also comes with a 2-year warranty and its EPA-compliant but also CARB-compliant, which is no small task. The California Air Resources Board has some hefty rules to follow in terms of regulating low-emissions. The fact that Yamaha’s EF2000iS earned it is a huge bonus. The second pick for inverter generator is the Champion Power Equipment 75537i inverter generator with wireless remote. This definitely is a solid silver winner because of its sheer power and added extras. It has a lot of benefits to it and not a whole lot of issue. This is perfect reliable energy delivered directly to you. The motor for this inverter generator offers 2800 watts rated, with a 3100 maximum wattage capacity. That’s a lot of power and most likely will fit your needs. It comes with a single 120-volt duplex outlet and one 12-volt outlet that has cables. It also has a USB for additional flexibility in use. The sheer power of this machine is what mainly drove it up to our number two spot. You aren’t going to find much it can’t power. The Champion 75537i also is highly efficient. Its inverter generator technology allows it to convert raw energy to clean energy. Just like the Yamaha above, you can easily power delicate electronics with it. The good thing about this one though is that it has a huge range of capabilities. Yes- it can manage an expensive laptop’s power, but it also can handle a 15,000btu air conditioner, or fuel an RV. The expanse of its power is what makes it a standout. It never limits you to what it can or cannot handle. Most likely anything you need energy help with –indoor or out—is going to benefit. It also can run up to about 8-full hours on one tank of gas. The design of the Champion 75537i is big. Designers did what they could to make it portable-friendly, but it isn’t as compact as the Yamaha EF2000iS. It also weights considerably more. At 95 pounds, it is quite a lift, but remember that it does bring a lot of power with it. Champion did add some good features to counter the size though. It has sturdy double handles and two wheels on one side. You can easily tip the machine with its folding handle and push it to where it needs to be stationed. At 27-inches by 18 ½-inches by 17 ½-inches it takes up more space too, so be prepared for that when planning for storage locations. The sound level of the Champion 75527i is fantastically quiet too. It emits just 58-decibels of noise. If you need an inverter generator in an area where noise is a factor, this one won’t be an issue. For example, some camp grounds require quiet—especially at night. If you need lots of power that won’t disrupt anyone, this may be the perfect machine for your needs. In terms of the extras, the Champion 75527i is both EPA and CARB-compliant and approved for use and sale in 50-states. The company Champion stands firmly behind its product by offering a 2-year warranty and lifetime support for any concerns you may have. It also has an idle feature that kicks in automatically when its load is reduced. This helps to save on the wear and tear put on the motor and saves fuel. It also has a remote control feature that is highly convenient. Imagine sitting at your campsite and being able to work your inverter generator from your lawn chair. You’ll love this feature! In the end, this is one of the best inverter converters around. You can easily use it for a wide variety of things and never have to worry about running out of power. It’s a sturdy and reliable choice and that’s why it made it all the way up to our silver slot. Our number three choice for inverter generators is the Honda EU2000I 2000 Watt Super Quiet Inverter Generator. This is another standout in the designs we reviewed. It has enough power, efficiency features and perks to give it a definite spot on our list of the best. The motor for the Honda EU2000I is powerful. It has 1600 watts and 120-volts of power to it. It can run for four hours at its 1600 watts rated. It also can be combined with another generator. This is a particularly convenient feature if you know you’ll need added power. Two machines easily can provide 4000 watts of power. This machine can handle any appliance from a small heater and a coffee maker to a large microwave and a freezer. Its multi-purpose design is definitely a benefit if you need power conveniently and quickly. It also offers clean power. The value here is that you can hook up your larger appliances to it for power, or you can hook up delicate machinery like laptops and televisions. A lot of people take large things into consideration with power needs, but fail to focus on the smaller items. Here is where a good generator that provides clean power is going to showcase its true advantage. It isn’t limited to a fueling a few items; rather, it can handle just about everything. The Honda EU2000I is also very user-friendly. It’s one of the simplest to work generators we reviewed. Coming in at 47-pounds makes it an easy lift for portability. It has a top-handle that is connected to the main body of the unit. It has 4 feet for stability and all controls are on the front of the machine. It has two AC out plugs and one DC 120V plug-in. Overall this is a standard generator that is easy to use. Even if you aren’t familiar with generator power or using one for various purposes, this one should offer minimum issues for setup or operation. In terms of noise level, the Honda EU2000I is another very quiet option for power. It emits a maximum of 59-decibels at a rated load. That means you won’t have to yell over its operation. It also is going to be useful in places where noise is a regulated concern, i.e., camp grounds. It also can easily be used while multiple conversations are going on in the vicinity. When it comes to the Honda EU2000I’s extras, there aren’t a whole lot. It is a standard machine that does what it’s supposed to—bring clean power to its user. It can operate up to about 8-hours on a single fuel tank. It is compact and that definitely is a perk. Dimensions are 20 ½-inches by 16 4/5-inches by 11 ½-inches. Its small size makes it perfect for storage without much inconvenience. 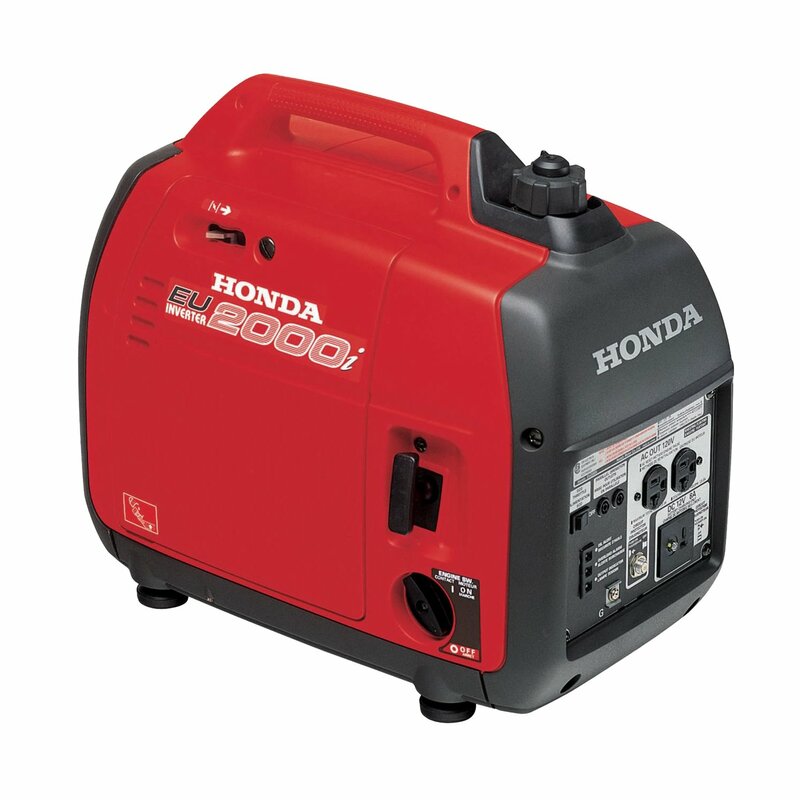 The Honda 2000I is the perfect compact design of inverter generator to round out our top three. It definitely is a contender if you are looking for portable energy. 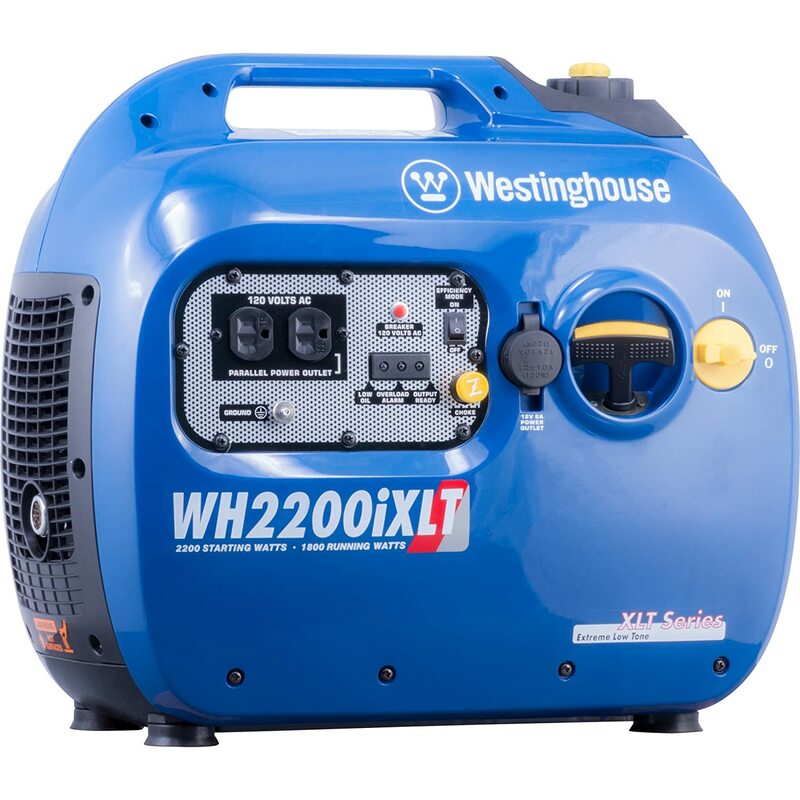 Our final budget pick goes to the Westinghouse WH2000iXLT Gas Powered Portable Inverter. This one is not one of the top three, but it still has enough benefit to be named as our budget product. The motor on the Westinghouse WH2000iXLT is 1800 watts and 120 volts of power. It comes with a 4-stroke 79cc OHV light on the engine. It has two 12V DC outlets for flexibility of use. It also has the ability to create cleaner energy than some of its competitors due to its Westinghouse-created innovative system. It can handle large loads or small electronics efficiently and easily. This one also comes with an overload breaker just in case you have an unexpected overload of power. It will disconnect the generator to avoid damaging the motor. When it comes to efficiency, the Westinghouse option is one that definitely stands up to our other picks. It also offers clean energy. That means it too can handle delicate electronics and larger more durable appliances. It easily runs for up to about 13-hours at a 50%-load. The long-lasting power it provides is a huge benefit. Although there are other machines that are bigger, for its size, this one is a standout. It has a feature called Smart Throttle Load. This is where it has a built in sensor to adjust the engine’s speed depending on required output. It gets help with modifying its power due to the dual coil alternator. This also reduces the amount of fuel needed to make it even more efficient. It also can recharge various batteries with the 9A12V DC output feature. This means it can help you power an RV, boat or an automobile whenever needed. You can also join a second generator to maximize your power due to its Twin Technology. It also has an easy-to-read low oil monitor that alerts you when it’s time to change. User-friendly models are critical in the market. The Westinghouse WH2000iXLT comes in at 44-pounds. That means it is easily transported to wherever you need it. It has a one-piece handle on the top bolted to the frame for easy-carry portability. Four sturdy legs at the bottom level it off. As a design, this is another choice that has the standard options. It doesn’t have a lot of unique features. Still, if you are looking for a durable inverter generator that will get the job done, this is still worth testing out. The controls are on one side for easy-reach. The dimensions are 17 1/8-inches by 12 ½-inches by 20 1/3-inches. This is another machine that you won’t have a problem figuring out if you are newer to the world of generators. This one also has a responsive startup thanks to Westinghouse’s auto-decompression. Overall, this is one of the easiest generators to start. The noise level of this Westinghouse generator is also quiet for its size. It emits about 51-decibels of noise, which means that you won’t have to raise your voice to have a normal conversation. It is perfect in a quieter setting or where noise is a concern. In terms of extras, the Westinghouse WH2000iXLT has a few worth noting. First of all there is the Twin Technology feature that is handy. It also has the easy-to-carry feature. It also has a long life span for extended use. Finally, the overload breaker is a nice feature if you aren’t confident in your energy requirements and there could be a potential overload. Together these all add up to a great product that definitely deserves to be our bonus pick for inverter generators. With all of our assessments we first think about what features are most desirable and what features will contribute the most benefit to the user. They are dependent on what the machine’s use is and centralized around that purpose. For inverter generators we chose: motor power, efficiency, user-friendliness, noise level and the normal “extras.” We believe that to put a machine at the top of any list, it has to possess outstanding results in all of the above categories. Each one of these five things have to all be on par, or better, to make an inverter generator a standout. Here are the definitions of what we looked for in each feature. The power of the motor is what inverter generators are all about. We wanted to put our top choices through the wringer in terms of scrutinizing the motor. Can it handle large energy demands? Can it handle them efficiently? Can it still handle delicate electronics? These were questions we asked when we were testing out the inverter generators on our list. We wanted to make sure that the power was there, but it was going to be useful power—power that could be used for a variety of different items needing energy. The motors also had to be powerful in themselves. We looked at voltages and watts. We also looked at what adaptors they had built into their systems. We wanted to know how long each one would operate also. This is a major concern if the generator is going to fuel an RV or boat. It needs to be able to sustain its power delivery for longer periods of time. To ensure that it is flexible and long-lasting were two major concerns we looked at. Finally, with the motor we also looked at technologies that helped to start them up and monitor energy output for efficiency. 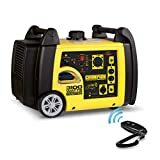 No one wants to have trouble starting up a generator. Older models were clumsy with that. Or required a lot of effort by their user. Thankfully today’s models are much more alert to the user’s needs and are built to work quickly. Manufacturers realize that bulky machines that take human effort to get going just weren’t working. They designed models that are top-notch and make lives easier. Another consideration was fuel-efficiency. Of course they all had to have the ability to convert to clean energy. That’s what makes them inverter generators. But they also had to have other features that helped to make them efficient machines as a whole. One great feature is the automatically monitored power emission. Let’s say you have a boat and hook it up to the generator. You may need the boat to have full power for the first 20-minutes of the ride, but once you’re at your destination lowering speed is fine. The generators with auto-monitoring features will lower the power output. This makes it great at saving fuel. We definitely saw this as a huge advantage to our users. Being efficient also affects the machine itself. We wanted machines that are long-lasting. That means that manufacturers needed to build some mechanism that helped machines extend their life span. When you purchase an inverter generator you don’t want to have to buy another one in a year. You want it to last—even under heavy use. That’s why efficiency also spanned into “How long is this machine going to last under the right usage conditions?” We want our readers to know that the products we herald are long-lasting—especially if they are an investment piece. Auto-monitoring features definitely help to sustain machines and save their motor’s power over time. In the end, efficiency was a big concern for us. Whether you are using just one inverter generator or joining two for added energy needs, we wanted to be confident that you are getting the best return for your investment dollars. Next to the motor and fuel efficiency, user-friendly designs were important to us. We understand that all of our readers are not contractors who are used to using generators. We wanted designs that would play well to a professional crowd and to a novice user. Controls on all of our inverter generators had to be easy-to-read and straightforward to manage. They had to be clear and centralized for ease of use too. We also looked at the handle and portability. With smaller models like our Honda EU2000I and the Westinghouse it isn’t that much of a concern. However, with larger models like the Champion, we definitely thought of how easily our readers would be able to move the machine. It is large and we wanted to be sure that users were given the right tools to make it easy to transport. The handles were also scrutinized. Although 50-pounds isn’t a huge load, if you have to carry it around for any length of time, it can be a chore. We wanted handles that were designed for heavy use and were easy to grip. Having user-friendly designs was a priority that all our inverter generators needed to make it onto our list of the best. If you ever used a generator decades ago then you know what a concern noise was. You started your generator and the banging sounds took over the entire house or yard or garage. Forget about talking or watching television. You also could say goodbye to hearing for the rest of the day due to the decibel level. In the old days, decibel level wasn’t even a concern. That is understandable for the time, but things are vastly different now and requirements are much stricter. Today’s models needed to overcome that. We have enough technologies today to build better generators when it comes to ear-breaking noise levels. This is definitely one thing we focused on with our inverter generators. We wanted to be sure that manufacturers were aware of the issue and found ways to overcome it. The good news though is that having maximum power without the noise is a definite option in today’s world. Thankfully, our chosen models all were built with noise reduction in mind. A lot of these generators are going to end up at camp grounds, or in homes where noise is a definite concern. They have to be able to run at full output without the deafening sounds of the motor. For universal usability this was a necessity. We tested decibel levels to ensure that they were as low as possible. Not only does that confirm that they can be useful in a variety of situations, it also proves that users are protecting their hearing long-term. Though we expected the normal qualities of a good inverter generator, we also asked for some extra perks. The perks are what set the mediocre apart from the good and the good apart from the great. Our reviews are seeking the great products out there so extras are important. Some of the extras we noted with inverter generators were the automatic features like auto-shut-offs and auto-adjusting of power levels. Any automatic feature helps the consumer to work the machine without having to vigilantly stand by to watch its performance. For example, if you use an inverter generator for a tailgating party, do you really want to have to stand by it to adjust it? Or, if you need it for an RV—do you want to be tied to your generator all night? Obviously not! Another important perk was the ability to store them easily and without a lot of lost space. Sure your inverter generator may get a lot of use, but at some point you will have to store it away. We weren’t looking for bulky machines that would block large areas. The perk is that we wanted the least amount of trouble for storage. We wanted to find inverter generators that had those special extras that made them even better models that we could champion to our readers. We are confident that the ones we chose are all the best in the group and the extras, in some cases, are what helped put them there. In the end the list of our top inverter generators came together relatively easily. We tested a lot, but the above four are definitely the top-of-the-line in terms of our review. If you need an inverter generator, look at the ones we chose. We did all the work for you. All you have to do is go out and purchase one to see how convenient and useful they really are.